The 20 Mini Birds Wall Decals are an exciting way to change the feng shui of an entire room in minutes! Turn spring-cleaning from chore to cherished memories this year with the 20 Mini Birds Wall Decals. You know that room you always hope your guests don’t enter? Take if from storage room to Zen masterpiece with this creation from Trendy Wall Designs. Each pack comes with 20 mini birds wall decals. Mix and match sizes and colors. Get creative with multiple arrangements. So easy to apply, simply just peel and stick! Choose flying right or flying left. I have a very large wall in the living room that needed something to fill it. I applied a large tree decal but needed the birds to complete the picture. 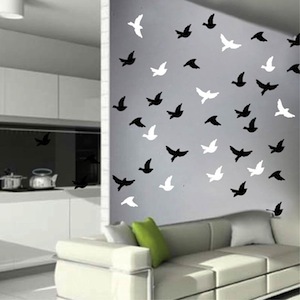 I found "Trendy Wall Designs" and ordered these bird decals. The wall with the tree and the flying birds looks great. I purchased the 4-6 "chocolate" color which matches the trunk of the tree. I have had many compliments. Very Happy with the purchase. No that's a good thing. These were super easy to install and finished our design well! These were really easy to install. We got them in 3 different colors and we mixed and matched them on the walls coming from the kitchen and flying towards the living room. I recommend any of these designs. Very cool.